How good is Mineral Makeup for your skin’s health? Mineral makeup is the latest buzz in beauty talks and fashion glossies. Celebrities, dermatologists, makeup artists all over the world are joining the bandwagon and recommending mineral makeup – the makeup with meaning. Its numerous skin benefits are being loudly promoted and endorsed and it is the latest extension in the thoughtful beauty products range. Minerals are naturally occurring substances, mined from the earth’s crust. 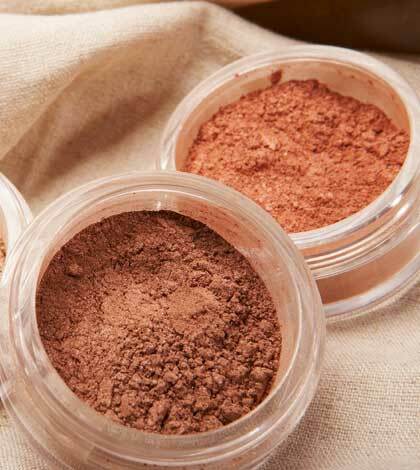 Mineral makeup comprises minerals, which are pulverized and sterilized into fine powder form. As most mineral products are preservative-free and fragrance-free, this is a great option for those who like to stay sober and closer to nature makeup. All the ingredients used in mineral makeup are free from any artificial fragrance, chemicals, silicones, talc, mica, oils, dye, fillers, rice powders, alcohol, and wax which could be potentially dangerous for sensitive skin types. Mineral makeup had a commercial start in the 1970s with the emphasis on all-natural makeup products. Mineral makeup is in a way a return to the makeup techniques used since ancient times when ancient people from many civilisations used to powder natural minerals to apply colour to the skin for decoration and/or camouflage. Products like kohl also come in the category of mineral makeup. Increasingly, mineral makeup is being prescribed by dermatologists for patients who have skin problems like excessive sensitivity, stubborn acne and uneven pigmentation. Many of the patients who have allergies and skin problems originating from or aggravating due to traditional makeup find perfect solutions in the benefits of mineral makeup. Some products in the traditional makeup range induce and aggravate skin imperfections by clogging skin pores whereas mineral makeup offers a natural solution. Ideal for Acne issues- Most of the formulas of mineral makeup consist of inorganic minerals and are oil-free thus they hinder the growth of bacteria and are especially beneficial for patients who have an acne-prone skin. Beneficial for sensitive skin – Mineral makeup products do not contain any sensitizers like artificial fragrances and chemical dyes that can be a major cause of skin allergies. Thus mineral makeup is gentle and perfect for sensitive skin types. Sun protection – Generally, the main ingredients in mineral makeup are zinc oxide and titanium dioxide and both these have sunscreen qualities that offer broad-spectrum sun protection from harmful UVA and UVB rays. Zinc oxide and titanium dioxide are not absorbed by the skin and give the skin a protective layer. Enhance the appearance of the skin- Titanium dioxide which is a chief ingredient in mineral makeup has high light refraction index which helps to diffuse the appearance of skin imperfections , breaks and blemishes and provides the skin a glossy look. Natural finish- Mineral makeup creates an absolutely natural finish, which is in tandem with the trendy non-makeup look that everyone aspires for. Though the makeup itself is extremely light and practically invisible, nevertheless it has long-lasting coverage giving the skin an even and smooth appearance. Ideal for special conditions – Mineral makeup is the preferred choice of dermatologists for patients who want to use makeup after a laser surgery, microdermabrasion, and chemical peel as it is free from any types of skin allergens. A product can be labelled “mineral” even when the percentage of minerals in its composition is less than one per cent of its total content. Such products may not provide all the benefits of mineral makeup. Mineral makeup is limited in its range of colours, so it can be difficult to find a perfect skin tone match. Mineral makeup is organic and an excellent alternative to traditional makeup products and the various issues associated with chemical based products. Sulakshna enjoys penning down her tips on fashion, beauty and wellness. She believes in beauty being skin deep and loves to present her ideas on skin care and eating right for the goodness to reflect on the skin.